A little after Stevie and I first got together we went to a dinner party at our friends’ house. They had just moved into a posh apartment in a really nice are of downtown Salt Lake City. At the time, Stevie and I were living at her mom’s house. 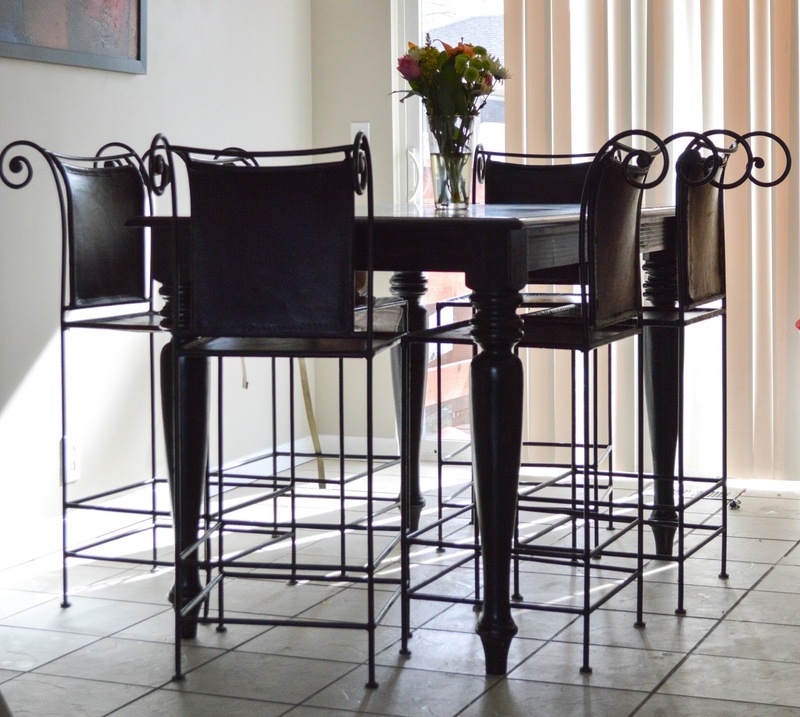 The first thing I noticed when we walked into their new apartment was the massive kitchen table they had. It was beautiful stained black wood, bar height, and had enough seating for 8 people around it. I’m not sure why, but that table imprinted on my psyche a level of accomplishment I had not yet achieved in my life. I was never bummed about not having a fancy car or nice clothes. I never felt like I needed a giant house to keep up with the Jones’s. But for some reason, I WANTED that table. 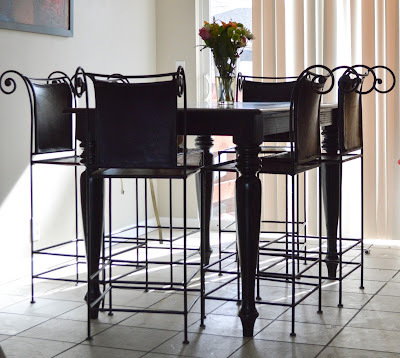 Three years later, when Stevie and I bought our home for our kid that was on her way, we also bought a big beautiful bar-height wooden table for me. OK, we didn’t actually buy it. Stevie’s mom gave it to us. But it was mine, and even though we didn’t technically earn or pay for it, it felt good having it in our kitchen. It was the table I had always pictured myself having. This is our old table without the leaf. It looked cooler with the leaf. There was one problem. Stevie hated that table. HATED it. She had her reasons. One, my wife is vertically challenged. She comes in at about 5.2, and climbing up into the wrought-iron leather-backed chairs was one of her least favorite parts of her day. The other reason she hated it? Our kids happen to be even more vertically challenged than Stevie, and unlike Stevie, climbing Mount Heavy Danger Chair was one of their FAVORITE things to do. We never had any actual accidents or injuries from bar-height falls, but as any parent can attest to, it isn’t the actual owies that cause the majority of the heart-hurt, it is the constant anticipation of them. With our big table, Stevie was in constant watch mode. But it was MY table. It represented being a grown-up – strangely more than owning a house and having a kid did. I fought tooth and nail against getting rid of it. And by “tooth and nail” I mean that every time Stevie brought up getting a new table, I changed the subject or put my fingers in my ears and yelled “NANANANANANANA” really loud. Because I am an adult. Except for the puffy chairs. I didn't want puffy chairs. With one picture, she had won. 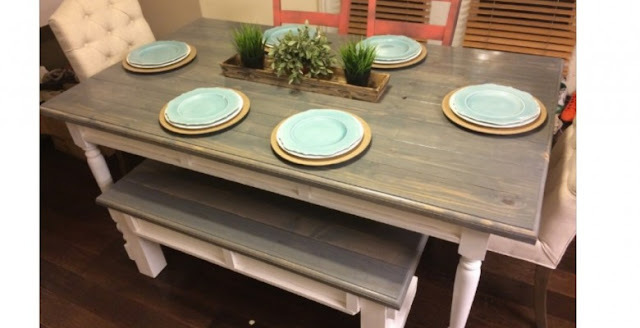 The thing was, just like when I first saw the big, tall table I was able to picture myself being an adult while sitting at it, when I saw the picture of this table I was able to picture my family sitting at it. Stevie posted our big table on Craigslist and we sold it to a guy who was super excited to have a great big table. Then we took the money and ordered our new, family table. I have to say, it has become the center of our home. Not only do our family dinners happen there, but the kids do their art projects on it. Where our old table was a giant, cold monolith, the family table draws people in. Lack of coasters left bubbles. It had some dings and scratches that bothered us immensely every time we noticed them. A ding in our "perfect" adult lives. Now we have a family table. It's rustic and beautiful down to every inch of its solid wood build. Water wicks off. And every ding will become a story. Sometimes, after the kids have gone to bed, Stevie and I find ourselves just chatting at it, asking each other about our days, joking around and listening… actually listening. I think that is what a good family table does. It doesn’t dominate the room, it pulls the room together. It pulls people together, face to face. It helps us see each other.